I love the holiday flavors that come out at Christmas time. If you are a fan, then you know the specific one I’m referring to…Peppermint! That’s right, and we have whipped up these chocolate peppermint cupcakes that you are going to love. Of course there is also eggnog, and chocolate everything. I can have decadent chocolate everything all year long, but the peppermint and eggnog, I seem to save just for December. Kind of like pumpkin, and only having that in November. I don’t know why I seem to follow those rules, but like everyone else, I do. Darn those marketers and grocery stores! This gourmet cupcake is pretty easy to make. I will let you know this is a pretty liquid batter. So don’t be worried if it looks like you did something wrong. I’m sure everything is going fine. I used 1/8 teaspoon peppermint extract. That gave these cupcakes a light peppermint flavor. Now if you are an over the top peppermint lover, you could go with 1/4 teaspoon peppermint extract. But what I noticed is that as each day went by I could taste the peppermint just a tiny bit more than the day before. So if you are a risk taker and a peppermint lover, go with 1/4 teaspoon. But a safe play is 1/8 teaspoon and decide next time if you want more when you make them again. For the frosting, it took a few drops to get the red color I was looking for. So go easy with the drops and add two at a time. Stir, see how the color looks then add another two if it’s too light or pink looking. The goal is to get the perfect color without the taste of the coloring. So in this case, less is more! You will notice this recipe uses powdered buttermilk. I’m a big fan of the powdered buttermilk. I have been using this Saco brand for a few years now and love it. We don’t use buttermilk much and I’m always angry when I have to throw 1/2 of the container away because it expired before I got to use it. You can find it in most grocery stores and Amazon also carries it. Now if cupcakes aren’t your thing, we did a 12 days of Christmas cookie recipe marathon (at least it felt like a marathon) a couple of years back. We whipped up quite a variety of holiday recipes. I hope you enjoy the holiday cupcakes as much as I did. Please share if you end up making the recipe. Happy holidays! Add oil, water, eggs, and peppermint extract one at a time and continue mixing until blended together. Use 1 1/2 cup and add a few drops of red food coloring until you have the color you are looking for. Use 1/2 cup for the stars around the base and top. Pipe the red onto the cupcakes and add the white stars at the base and top. Those cupcakes are almost too cute to eat!! I love them and I am excited to make some for my kids – they will love them. I love chocolate and peppermint together. It sort of signals Christmas for me. I love the cute Santa hat topping idea you’ve done! So, I’m actually a giant weirdo who hates peppermint, but these are so adorable I can’t not make them! Leave out the peppermint extract and you will have one of the best chocolate cupcakes ever. Oh, my word. You had me at chocolate. These sound so delicious and perfect for the holidays. I so love how you decorated these cupcakes! It’s perfect for having on the dessert table this Christmas. I’m really curious about the taste! I’m sure it’s amazing! Give it a try, they are super easy to make. Your cupcakes are gorgeous – I always envision that I can make gorgeous cupcakes and then my frosting always looks so messy! Give it a try. This decoration is super simple. I always practice first on a piece of parchment paper. Then I don’t waste the frosting and can just scoop it back into the piping bag. Oooooh! They look so goood! So delish! Too bad I cannot have them as I just got over being pre-diabetic. But I can make them for others! Thanks for sharing your recipe! These almost look too good to eat. Peppermint reminds me of the holidays and I will definitely have to add these to my holiday baking. Cupcakes are life! I like making them as much as I like eating them! I’m always in for a creative cupcake, and I’ve found it! Talk about a cupcake that’s perfect for the occasion. This is definitely a must try, it’s something that’s also worth giving away to family and friends! It makes great gifts or just dessert for any holiday occasion. Wow these look decadent! I love peppermint and chocolate together! I would love to try these with a big glass of milk! I love chocolate mint anything. These sound really good, but boy are they cute like little Santa hats! Your red is so vibrant. Mine always looks more pinkish than red. Delicious. A couple of more drops of the color and you will have it. These look adorable! 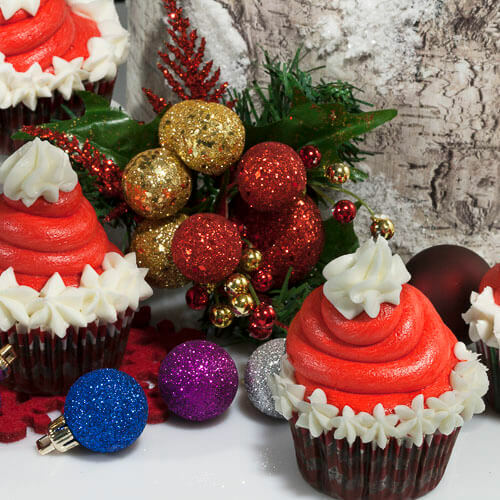 I love all the cute little holiday themed treats like this! My kids on the other hand are OBSESSED with them! How professional those cupcakes look. Those would be the hit of a party for sure. Great job! Is it wrong that every time I need a new recipe for chocolate and peppermint I do a happy dance? l just love the flavor and all the treats that showcase the rich, deliciousness that is chocolate and peppermint. These look delicious! Something about chocolate and peppermint together really just makes my soul happy! These look super cute! So festive and sound like they’d be delicious. I love peppermint so if for sure eat a few of these! I love making cupcakes, especially during the holiday season. 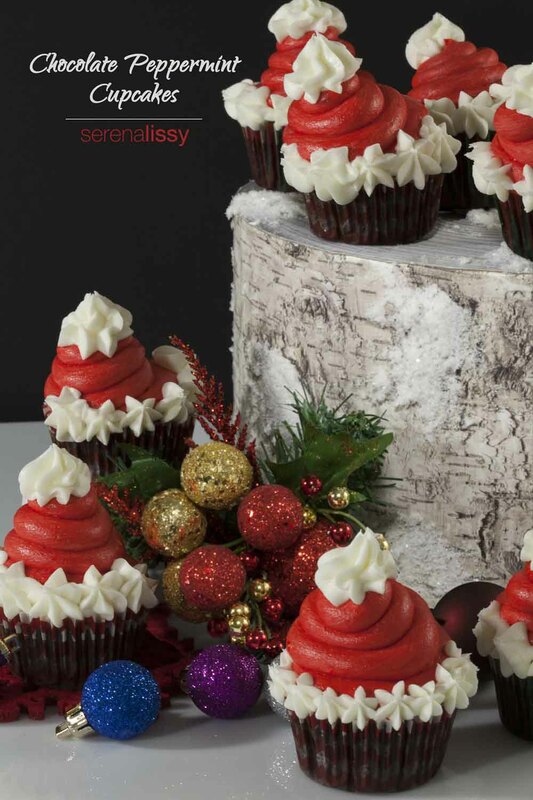 I don’t believe I have ever tried chocolate peppermint cupcakes, but they look amazing! They are so delicious! Thanks! Cupcakes are like the only baked goods that I’m good at making! I need to try this recipe!